Oh, no! Someone has stolen the Mona Woofa from the Dogopolis Museum of Art and the police don't even realize that they are barking up the wrong tree when they collar their number one suspect. So it's up to Art Dog, the mysterious, masked painter who roams the streets of Dogopolis, to find the missing masterpiece. Zip! Splash! Smoosh! He paints himself a Brushmobile, and he's off––on a wild and funny chase to capture the dastardly crooks. With the same deft touches of high-spirited fun and adventure that have made Mystery on the Docks and Mama Don't Allow (both Reading Rainbow Featured Selections) such perennially popular stories, Thacher Hurd serves up a new action-packed tale that will delight young readers. 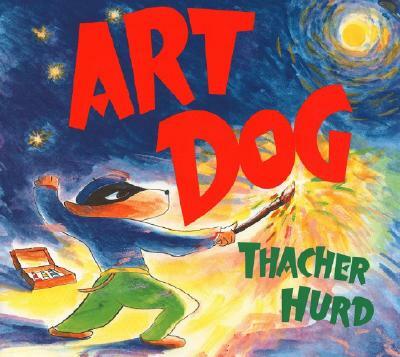 Thacher Hurd is the award-winning author and illustrator of several children's books. He lives with his wife, Olivia, in Berkeley, California. Thacher Hurd es un autor e ilustrador que ha recibido varios premios por sus libros para niños. Vive con su esposa, Olivia, en Berkeley, California.